For the first time, scientists have estimated how much plastic in the ocean comes from the land, as opposed to from ships and fishing vessels. And it’s not a small number. A study published in the journal Science calculates that 8 million tons of plastic trash makes its way into the ocean each year. “This is equivalent to five large trash bags full of plastic trash, for every foot of coastline in the world,” says study co-author Jenna Jambeck, an environmental engineer at the University of Georgia. That number is the middle of the range of estimates the researchers came up with; the total may be as low as 4.8 million tons but could be as high as 12.7 million. And it could get worse: Under a “business as usual” scenario where no major waste management changes are made, that number is set to double by 2025, Jambeck adds. This “ground breaking study” shows that “the oceans are likely to be even more contaminated than we have previously considered based on counting litter at sea and on shorelines,” says Richard Thompson, a marine biologist at Plymouth University. The top 20 waste contributors are all developing countries with densely populated coasts—with one notable exception: The United States comes in at number 20 on the list. 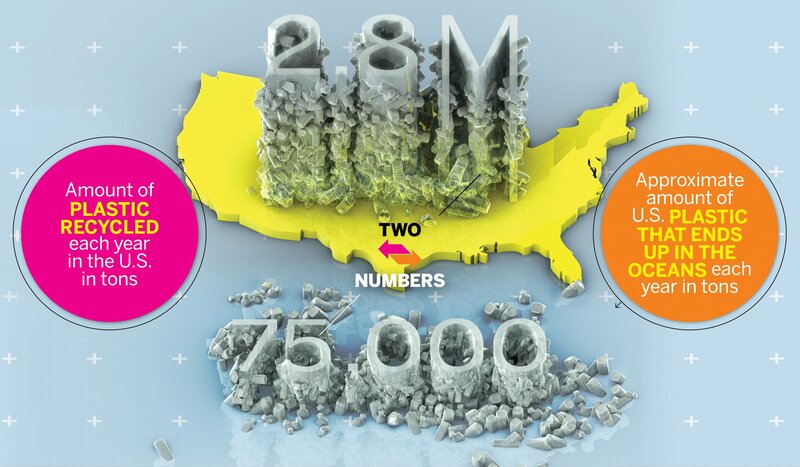 Approximately 75,000 tons of American plastic waste enters the oceans via the land each year, the study noted. To put that in context, the U.S. recycles 2.8 million tons of plastic annually, according to the U.S. Environmental Protection Agency. China is far and away the largest contributor to the problem, producing about 2.4 million tons of plastic waste each year, accounting for 28 percent of the world’s total. But Jambeck was quick to say that this study isn’t about pointing fingers or assigning blame. It’s a problem that everybody contributes to and can help improve, she says. Previous studies have shown that there are 270,000 tons of microplastics—tiny particles and fibers of plastic—floating on the surface of the world's oceans. And there's even more plastic trash on the ocean bottom. In one area of seafloor in the remote Indian Ocean that is about one-third the size of Central Park, scientists recently counted an estimated 4 billion plastic fibers. They believe that the ocean is equally polluted in many other places. Plastic pollution is a problem for many reasons. Most obviously it can entangle and choke animals like sea turtles, birds and mammals like dolphins. Plastics can also both soak up and leach out toxins that can make their way into sea animal’s bodies, potentially accumulating in the food web and finally ending up in seafood that humans eat, says Chelsea Rochman, an ecotoxicologist at the University of California-Davis who wasn’t involved in the study. Jambeck says the solution to this marine problem lies on land. Marcus Eriksen, the director of research at 5 Gyres, an environmental and research organization, concurs. “It’s not sensible to go to the ocean with nets to capture trash, but rather to focus on mitigation strategies on land,” says Eriksen. To reduce waste, countries have to come up with better “collection, capture and containment” methods, Jambeck says. 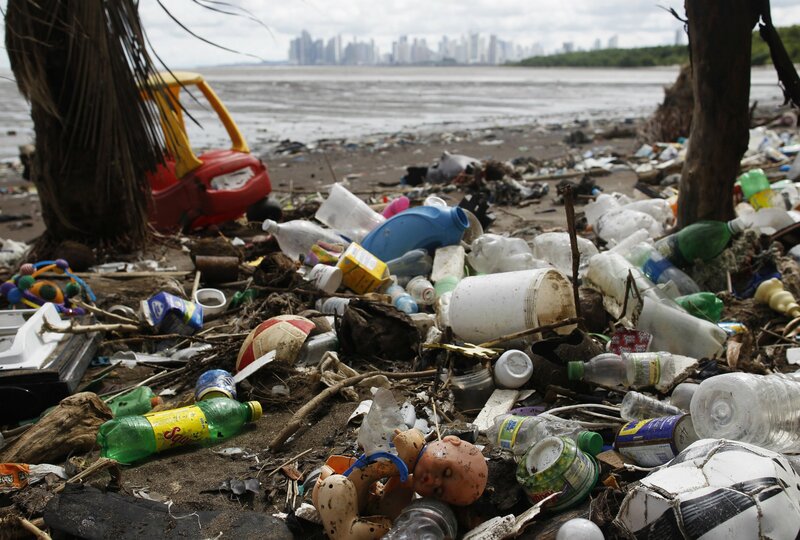 Much of the plastic that ends up in the ocean from the land is carried by water, and also the wind. So a properly managed waste stream is important, she says. Correction: An earlier version of this article incorrectly stated that approximately 750,000 tons of American plastic waste enters the oceans via the land each year. In fact, the number is about 75,000 tons.